Two trillion dollars: this was the price tag Riyadh put on the jewel in its crown, state oil and gas giant Aramco. This is how much the company was worth, officials said, if you multiplied its proven reserves by a factor of US$8, which is the figure used to value oil and gas reserves. There were doubts about that valuation from the start, and now these are deepening as the company crawls closer to the initial public offering. For starters Aramco’s opacity was very likely to make potential investors suspicious. Aramco has never published financial reports. Although there were assurances that it will start doing so ahead of the IPO, to date the latest entry on Aramco’s Corporate Reports page is from July 20 last year, and includes production figures for 2016. Last year, sources had told Reuters the company was planning to start publishing financial reports early this year, but this has not happened yet. Leaving these concerns aside, there is the bigger problem of the valuation methodology itself. 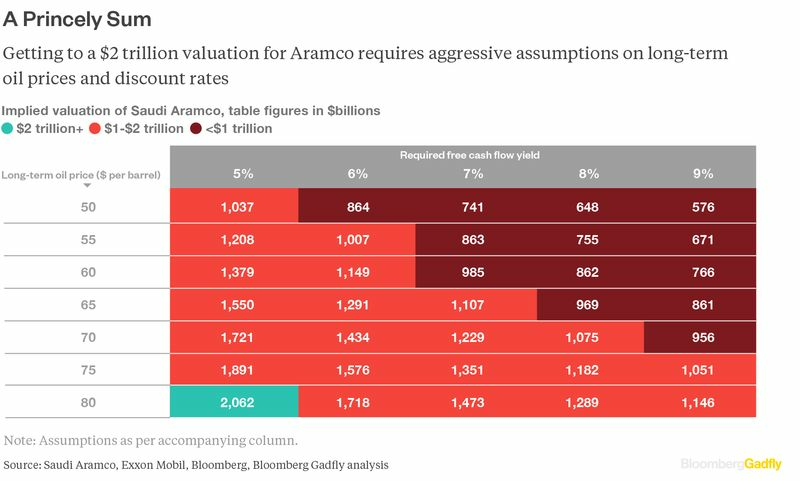 In a blunt but very informative story for Bloomberg Gadfly, Liam Denning suggests that Aramco may need crude oil at US$80 a barrel to get the US$2-trillion valuation it claims it has. That’s in addition to making several wild assumptions along the way. The oil world today is different from what it was just five years ago. The oil price collapse taught oil producers to be more economical and to pick their projects more carefully to keep cash flows coming in and sharing them with shareholders. Yes, they had to sell additional stock, and some suspended dividends, but the lesson was learned, and the moment prices started perking up, dividends returned, and stock was bought back. Yields are what investors want when they consider whether to invest in a company, Denning says. They don’t care about proven reserves and production costs as such. Instead, they care about how these can turn into dividends. It’s as simple as that, but this is where it stops being simple. The average free cash flow yield of the global oil supermajors is between 5 and 7 percent. Russia’s Rosneft, while not a supermajor per se, sports the highest one, at 12.950 percent, while Exxon has the lowest at 5.194 percent. Based on these actual figures, Denning makes an entertaining set of calculations involving major assumptions about the price of oil, Aramco’s production and costs, and profit margins. The result is that to lure investors with a 5-percent cash flow yield (the minimum that would make it competitive), Aramco needs oil to sell for US$80 a barrel. This is the only scenario where it can be valued at US$2 trillion: the only scenario out of 35, all based on favorable assumptions. Oil is not going up to US$80 anytime soon unless something cataclysmic happens. Denning is also generously—and deliberately—not factoring in the inherent regional risk in the Middle East that is likely to act as a deterrent to potential investors. The publicity machine around the IPO has begun to creak already. Recently all those suspecting Aramco won’t make its own deadline for the IPO had to pleasure to be proved right: Saudi officials said it will be delayed until next year. Investors want cash, not massive reserves. Maybe this would prove a lesson Aramco has to learn the hard way. Is OPEC Producing More Oil Than It Claims? It is my considered opinion that Saudi Arabia is going to withdraw the IPO of Saudi Aramco altogether. Therefore, all talk about the Aramco valuation, Saudi proven reserves, the right price for the launch of the IPO, where to list it and yields for investors is now academic. 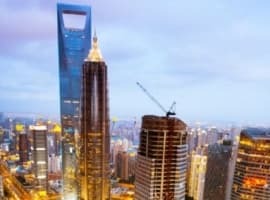 My opinion is based on the following factors: first, Saudi Arabia is no longer financially in need of the IPO; second, Saudi valuation of the IPO is far bigger than Wall Street’s and other financial companies’ valuations; and third, there are many economic and geopolitical issues involved with the IPO not least among them risk of litigation by the United States. 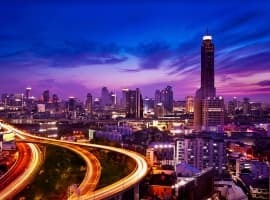 The Aramco IPO was originally proposed as part of Saudi Arabia’s Vision 2030 with the objective of securing an estimated $100 bn from the sale of 5% of Saudi Aramco in support of Saudi diversification of the economy. At the time of the proposal, oil prices were ranging from $45-$50/barrel and the Saudi economy was in a dire situation. The recent rise in oil prices is already starting to repair the damage inflicted on the Saudi economy by the oil price crash in 2014. So financially, Saudi Arabia has no need for the IPO. 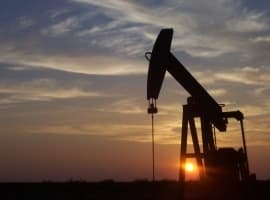 As for the assertion that oil is not going up to $80 anytime soon, the very positive fundamentals of the global oil market as projected for this year and also 2019, could see oil prices reach $80 and even higher next year. And how long ago were those reserves confirmed by an industry accredited firm? Sorry, even with 35 different valuation scenarios this IPO is just to opaque. Mamdouh, I agree with your general thrust. But Saudi Arabia still needs the $$$ from the IPO since they have drawn down their reserves and their economy is basically oil or nothing. Clawing back ill-gotten gains from spoiled princes and cutting entitlement spending will help, but not enough to make up for oil prices being 40% lower than a few years ago. As for ARAMACO's $2 trillion valuation: Saudi Arabia may or may not have 250 billion barrels of oil. That figure was never done geologically, it was done politically. OPEC production quotas in the 1970's and 1980's were based on proven reserves. The more oil you had, the more you got to produce. This created a race-for-reserves which allowed countries to pump more oil. This led to the 1986 Oil Price Crash. I am not a believer per se in Matt Simmon's "Twilight In The Desert" which is a peak oil book and has been largely discredited. Still, ever since the Royal Dutch Shell reserve debacle, reserve accounting for publicly-traded companies is very stringent. If ARAMCO wants a $2 trillion valuation, they need to show the oil. They also need to show how they can turn that oil into productive cash flows....how minority investors will be protected.....how the political situation in the country affects the oil company.....currency issues....etc. Sell the stock at a cheap valuation; keep alot of shares; then execute and raise the value of the floated position and raise your remaining holdings. That's how you get your $2 trillion valuation -- if you are worth it. Add it all up, and I think a valuation of $1.25 trillion is more than fair. I would advise MBS to take it. Oil is not going up to US$80 anytime soon unless something cataclysmic happens. Seems like your are as clueless about your "Field of Expertise" as the readers of your article are.